This one is a work in progress because there are SO many strawberries. 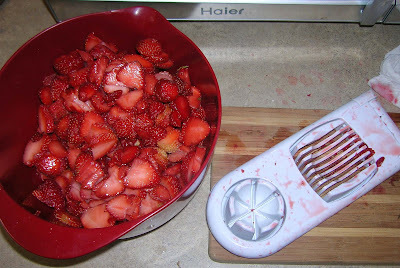 I used Martha's handy strawberry-cutting trick: The egg slicer! It was a brilliant and efficient way to attack the pile. A large bag was frozen for strawberry smoothies and ice cream, which we plan on making in the coming week. I enjoyed a little strawberry shortcake - with chocolate whip cream - and oh my was it delicious! Tonight I am making an arugula salad with strawberries and hazelnuts for dinning al fresco. Roast nuts in a shallow baking pan in middle of oven until golden, 10 to 15 minutes. Rub warm nuts in a kitchen towel to remove skins (don't worry if some skins don't come off). Cool nuts, then coarsely chop. Whisk together vinegar, lemon juice, shallot, sugar, and salt and pepper to taste. Add oils in a slow stream, whisking until combined well. Toss together arugula, strawberries, hazelnuts, and dressing. Divide salad among plates and dot with goat cheese. 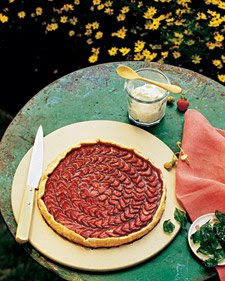 And tomorrow, I think I'll make Martha's strawberry galette... if I haven't had my fill. Fantastic! 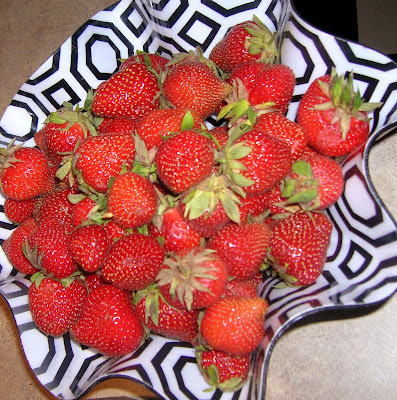 I love me some strawberries...please, please make the galette! I think using an egg slicer is a great idea! I wonder though, what brand egg slicer do you have? I bought one and the wires all broke on my first attempt with a strawberry... I had been looking forward to flying through those berries and was really bummed when it broke. Would you recommend the kind you have? It looks like its still in one piece!